Help keep debris out of your pond with the Atlantic Water Garden Pond Net. This sturdy net prevents leaves and twigs from settling to the bottom of your pond, for a crisp and clean water feature. 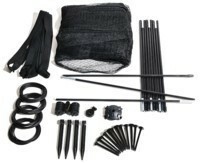 The 0.5" square mesh has UV light protection, so it will not break down for several seasons, and the included black pegs help secure the item around the perimeter of your pond. Keep this net in the included reusable storage bag when not in use, for a handy package. Protect your pond from debris and predators using this Pond Net.